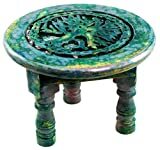 This modest altar table, decorated with a complex image of the tree of existence, encircled win a wide wreath of Celtic knots formed from its roots, is excellent for anybody who needs a portable surface if they can\'t maintain their altar out in the open, or for the practitioner on the go, who could use a portable surface for their rituals and practices in their travels. It measures roughly 6 inches in diameter and about 4 one/4 inches in height, and stands on three wooden legs. Gives a rustic green color with magenta highlights. Outdated planet rustic coloring.